Three words that, to someone like me, are just as important as “I love you.” Okay…well…maybe not, but this comes really close in my book. For the longest time, the gluten-free market was devoid of graham crackers. There were a couple out there…sure, most notably Kinnikinnick’s S’moreables and Schär’s Honeygrams…which I’ve sampled, but have never purchased for myself. Oh, and there are plenty or recipes out there. Even the famous GF Jules was selling a mix where you could bake your own. But cracker baking and I don’t always get along…and the gluten free snack isles were still missing that WOW with the graham cracker love. Pamela’s Products first announced their latest product breakthrough at this year’s Expo West. They were going to be offering two different types of snack crackers…in the sweetened graham form. Graham crackers!! Graham crackers that reached beyond the ordinary. In fact, Pamela’s Products stepped it up and took graham cracker snacking to the next level by offering two different sizes…Graham Cracker Size and Mini Grahams…in three (3) flavors: Honey, Cinnamon, and Chocolate. How can you NOT get on board with this??! The hardest part, initially…was finding them. I searched high and low in my area for these and finally gave up, believing that it would take at least a year for the Louisville area to get them in. But then, randomly one afternoon with a quick stop by my Kroger (of all places)…two flavors of the mini grahams sat on a shelf, illuminated in the heavenly fluorescent grocery store lights. And, yes, I snagged a box of each and took them home with me. I had to have them. I’d been searching for them. It had to happen. Previously, I devoured the box of the Pamela’s Products Gluten Free Mini Cinnamon Grahams by making up little deconstructed S’mores bowls for desserts. The box of the Mini Chocolate Grahams have been waiting their turn to shine, but with summer in full swing, I was all about cool treats from the freezer. 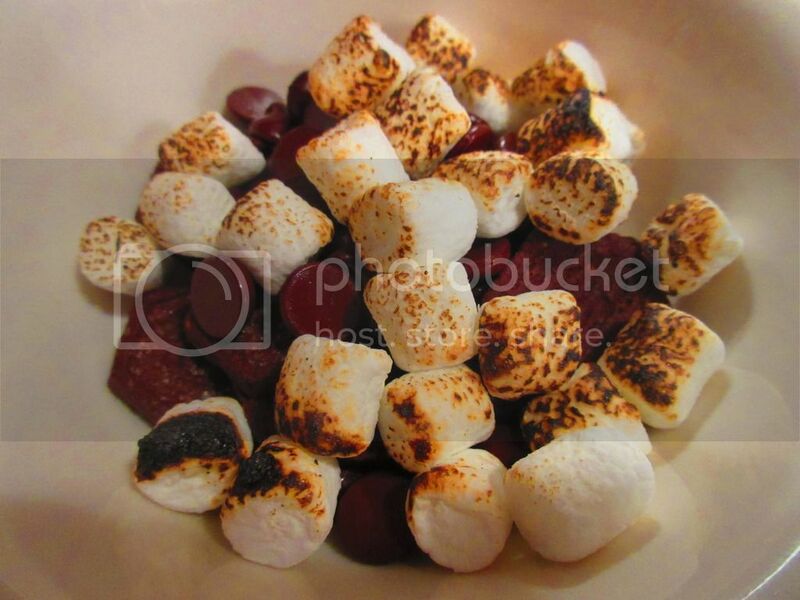 But the cooler fall temperatures are moving in…and with that…out comes the big bowl of S’mores-y goodness once again. But this time…with a complete chocolate spin. Yep…the Pamela’s Products Gluten Free Mini Chocolate Grahams came down from the top pantry shelf tonight. And into a couple of bowls they went. Just as with the Cinnamon variety, the Mini Chocolate Grahams are also little medallions of graham cracker goodness…about the size of a quarter, sporting a gorgeous “P” for “Pamela” on each one. The Mini Chocolate Grahams are shaped like little hexagons, perfect for one-bite servings, especially if you just want something mindless and easy for snacking purposes. Or, hey…dip them into milk or coffee. YUM! But, now I’m getting away from the point. The point is…they are the perfect snack size. I popped a few to much on (for the sake of the blog, you know!) while building the Double Chocolate S’mores Bowls tonight. This dessert started with a layer of the Pamela’s Products Gluten Free Mini Chocolate Grahams, a tablespoon of dark chocolate chips, and then topped off with vegan marshmallows, which I then toast with my kitchen torch, successfully melting the chocolate chips in the process. In essence…the ideal dessert bowl of marshmallow perfection. 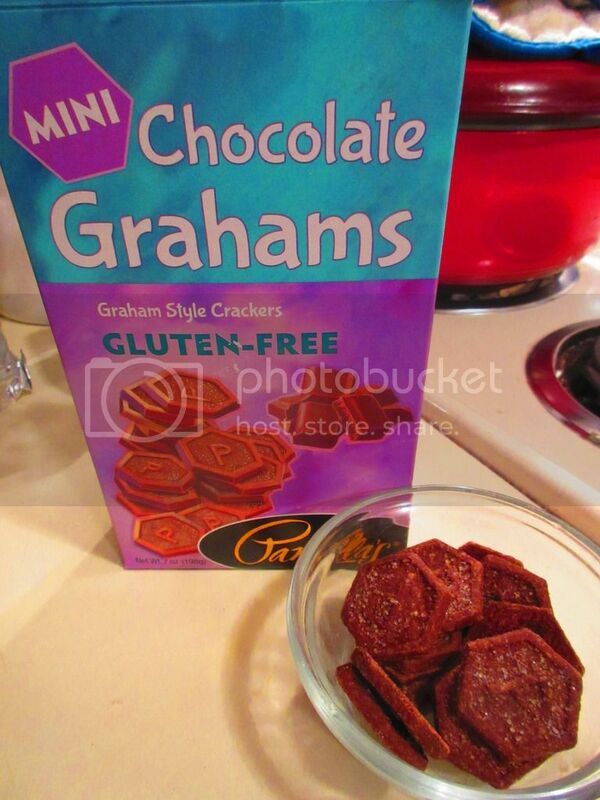 Oh chocolate gods above…this is the perfect…perfect mini graham snack. These crackers make all other chocolate snacks pale in comparison. Not only are they crunchy, but they are sweet and packed with a chocolate punch, that doesn’t overpower, but definitely lets you know…this graham cracker is chocolate…not honey…not cinnamon. Chocolate, baby! I love that each cracker is lightly dusted with a bit of sugar, bringing out a nice hit of sweetness. And when paired with the melt-y dark chocolate chips and the toasted mini vegan marshmallows…oh…dessert nirvana. S’mores taken to the next dessert level. Who says you need a campfire?! For that matter, who says S’mores can’t be made gluten free. These crackers are AMAZING!! Sinfully deliciously good. The Pamela’s Products Gluten Free Mini Chocolate Grahams are ideal for snacking, munching, dunking, or for use on desserts, as a pie crust, topping off ice cream…making mini ice cream sandwiches, or simply putting over your morning cereal (I make a killer S’mores hot cereal…that these will be DELICIOUS on!). What’s not to love, especially when all that flavor comes from real cocoa!! Let’s discuss what the Pamela’s Products Gluten Free Mini Chocolate Grahams are made from, shall we? This particular treat is made up of a gluten free flour blend (brown rice flour, white rice flour, tapioca starch, sweet rice flour, xanthan gum), brown cane sugar, organic non-GMO butter (salted), cocoa powder, gluten-free oat bran, organic non-GMO honey, molasses, gluten-free flavors, baking soda, grainless and aluminum free baking powder (sodium acid pyrophosphate, potato starch, sodium bicarbonate), sea salt, and a topping that is made up of organic sugar. This product is certified gluten-free by GFCO, made in a dedicated gluten-free facility, and kosher certified. They are gluten-free, wheat-free, soy-free, corn-free, nut-free, egg-free, contain no artificial flavors or additives, contain no hydrogenated oils or trans fats, and contain no corn syrup. The nutritional facts for the Pamela’s Products Gluten Free Mini Chocolate Grahams aren’t too bad either. A serving size is 10 crackers (29 grams) and there are about 7 servings per box. This serving will provide you with 140 calories, 6 grams fat, 3.5 grams saturated fat, 0 grams trans fat, 15 mg cholesterol, 140 mg sodium, 22 grams carbohydrates, 1 gram fiber, 11 grams sugars, and 1 gram of protein. Not too bad for a handful of chocolate mini graham crackers, right?! I’m happy with it. Happily eating straight out of the box. HA! No…we all know, I’m the queen of portion sizes. I live by my kitchen scale! So…feel free to find, purchase, open, and snack away on a box of Pamela’s Products Gluten Free Mini Chocolate Grahams. Munch, crunch, dunk, dip, or pile high with chocolate and marshmallows…and devour. Do whatever it is you want with these little miniature graham crackers. These gluten-free treats are fantastic. A great chocolate snack that will definitely curb your craving…without denying you that fantastic chocolate flavor you love and crave. Trust me…you’ll want more than one box. This entry was posted in Chocolate, Crackers, Dessert, Food, Gluten-Free, Products, Review, Snacks, Sweet Stuff, Vegetarian by The Celiathlete. Bookmark the permalink.